I am gearing up for an awesome Buster Film Centennial Celebration! 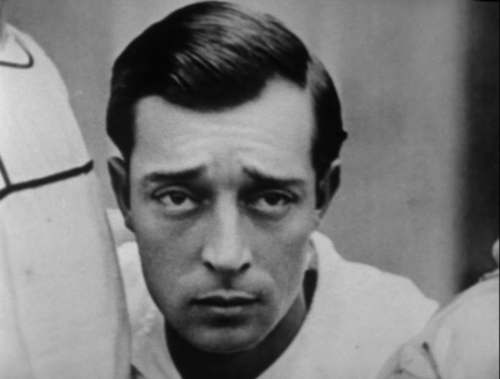 As I've been highlighting in my last couple of posts, it was 100 years ago *now* that Buster Keaton began his career in film. Oh my gosh, gives me shivers. As anyone reading this must know -- both in terms of how I feel about it, and probably how they themselves feel about it -- this was a momentous event for the future of cinema. Specifically, by a lucky twist of fate, Keaton was on the brink of a solo stage career (having grown up working in an act with his parents), when a chance meeting brought him in contact with Roscoe "Fatty" Arbuckle, who was shooting a film for a new motion picture company. Arbuckle invited Keaton to see the set at Comique Film Corp., ...then asked him to appear in the film, ... then to join the team. Keaton ate up the experience, joined forces with Arbuckle immediately and was able to get a toe in cinema with Arbuckle as his great friend and mentor. It was Arbuckle's force, talent and support that put Keaton on solid footing from which he was able to springboard into the world of cinema on his own. Many are aware that film they were shooting that day, The Butcher Boy, was to be young Keaton's first screen appearance,; however, it seems to go unsaid -- and I didn't realize this myself -- but The Butcher Boy was Comique Film Corp's first film as well. Here is what I wanted to say next, something short and sweet, like: "Comique went on to make x films, x of which co-starred Keaton," but the problem is that the film companies are complicated! In just reading a Wikipedia article, I realized that the same film enterprise (Comique) that produced Fatty's films, went on to be associated with Keaton's short films too, though those films were released through different companies. It gets a bit complicated to work out the details. 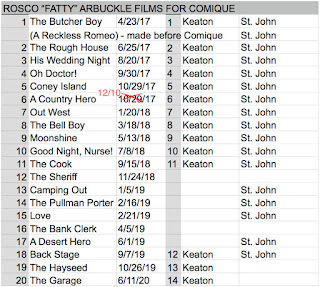 Suffice it to say that these early Comique films were released for Paramount, and these are the ones I associate with Arbuckle -- and that number of films appears to be 21, er 20... and includes films ranging from 1917's The Butcher Boy through 1920's The Garage. 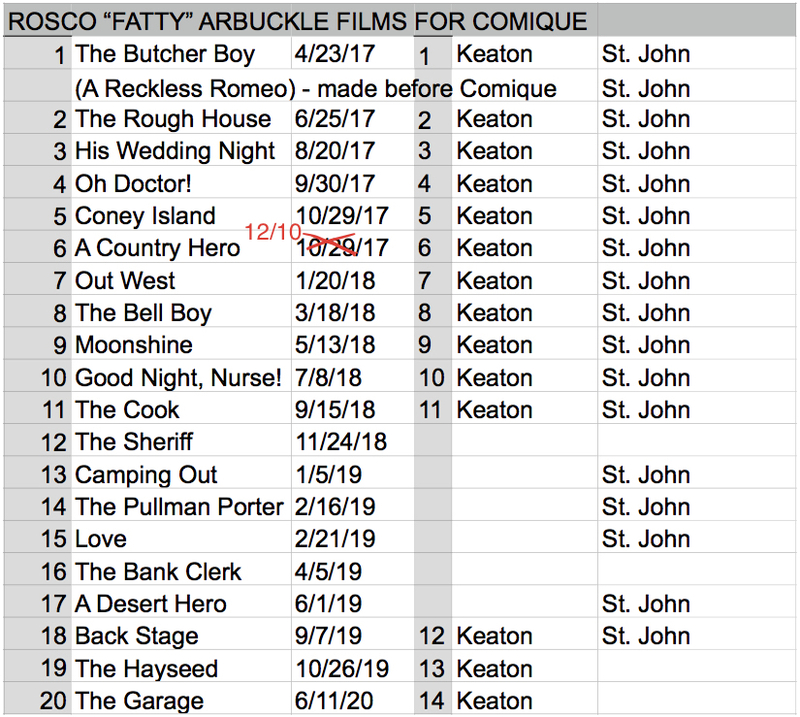 (Though, really, I just never get a break - the data is still messy because of films like "A Reckless Romeo" which was made by Arbuckle for Keystone, but then released as a Comique pictures film just after The Butcher Boy. argh - this stuff can feel very confusing. 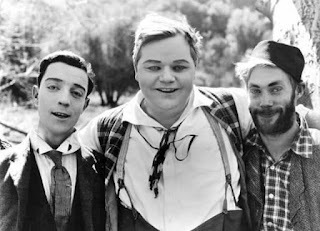 The right thing to do is to trust the Damfinos; BusterKeaton.com has a nice section devoted to Arbuckle, and on it I have what I'm going to call "the official" filmography for Arbuckle. From this, I'm going with the count of 20 "Comique Arbuckle" films, and Buster appeared in 14. Al St. John by the way (pictured above on the right) was in almost all of the films too. I am looking forward to this project. And will end this post on the hope and belief that on April 23rd, the Centennial of when the film was released in theaters, I will upload my post on The Butcher Boy.